I was introduced to a new term today: “superjob.” A post on the Wild Woman Fundraising blog notes that according to the Wall Street Journal, this is “a nifty euphemism for employees doing more than one job’s worth of work.” This got me thinking that this term could also apply to anyone who’s worked in a small-staff or volunteer-run non-profit or membership organization! Back when I worked in a small staff association, I always told people that I “wore many hats,” or that I “managed a lot of different portfolios.” But the reality was that I had to juggle many priorities and there was always more work to do than I could ever accomplish, even if I worked 24/7 straight. I tried to do it all and often wound-up burnt out and a little bitter. So for those faced with a non-profit “superjob,” how can you remain productive in the two or three roles you play, have a personal life and maintain your sanity? Effective time management. I know there will be a lot of great posts submitted to the Nonprofit Blog Carnival’s Best Time Management Tips post, but I thought I'd add my “two-cents worth.” After many years of struggling with work-life balance, I found that when I started tracking my time hourly for free-lance billing purposes, I got serious about setting priorities and managing my time wisely. 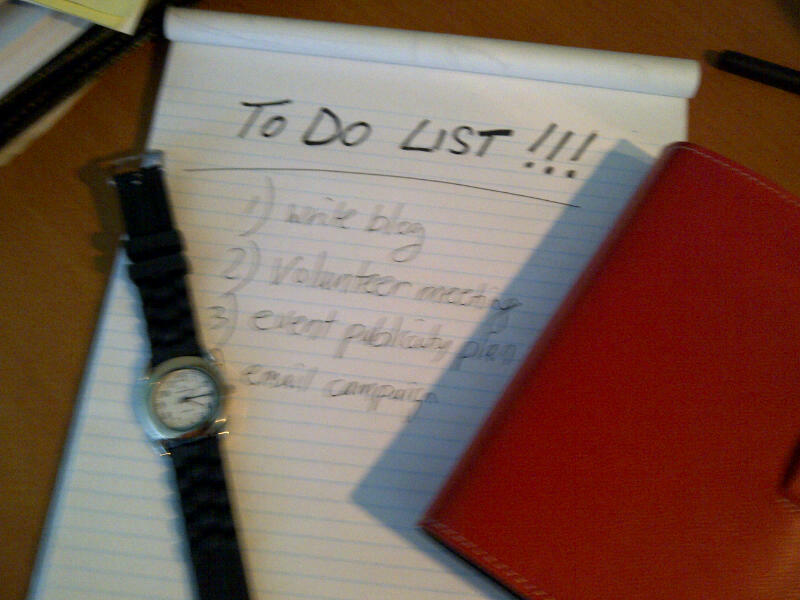 So here are a just a few tips to help you get started with time management. If you’ve never kept a time log, give it a try. Keep track of your time and activities each day for a full work week (and weekend if you bring work home!). If you do this thoroughly and honestly, you may be surprised at what you’re spending time on. In addition, by getting a realistic snapshot of what you accomplish in a typical week, you might feel more satisfied and even more in control. Are you being time efficient? are you in too many meetings that you may not need to attend? are you spending too long agonizing over writing a report or another writing assignment? are there any tasks that are really out of scope that you can delegate to another staff member or a volunteer? If your organization or department has developed an action plan (e.g., a Communications Plan, Project Plan, Volunteer Development Plan or Fundraising Plan) identify key priorities from the plan for the month ahead, then break these down into actionable items each week. Of course, there will always be a multitude of activities and tasks that arise on any given day, but try your best to prioritize these along with your initial list – even on a daily basis. It is so satisfying to be able to check things off a list, instead of just constantly adding things on the fly. I’ve been in situations where each day I had to figure out what was “mission-critical” and what could be held over or could even fall off the list. I know this sounds crazy – who has time for idle thinking? But researchers have concluded that “innovation is an active endeavor” and creative, innovators are made not born. A CNNMoney blog post notes that even one hour per week of focused though on critical problems can offer great value to you and your organization. With some time for clear thought, you might be able to find a solution or create a plan that will help you and/or your organization achieve your goals. Apparently, it takes 21 days of repetitive activity for your brain to accept new behavior as a habit. So once you identify some time management rituals that work for you, give them a try for a few weeks to see if you can make it work or if it makes a difference. Check out the Non-profit Blog Carnival - Best Time Management Tips (after July 28th) for a round-up of time management posts. Good ideas … if you have other staff members to whom you can delegate your “out of scope” tasks or if you really don’t have to be in that meeting. But at nonprofits, the problem is more often a serious shortage of the staff and technology that allow people to focus and be efficient. What may be necessary is a talk with funders about what it takes to run the organization and funding realistic operating expenses. A trick from my days as a consulting project manager- use outlook or another calendar s/ware to record how you spent your time all day (down to 30 minutes or whatever). As the day progresses, fill in how you spent your time. After a week or two, you'll be able to reflect on how you spent your time. Geri and AlexJB: Great advice - thanks. Thanks for linking to my blog post. Actually, my blog is all about nonprofit management and careers, and my post is all about nonprofit workers having super jobs. And while I appreciate your link, I don't think the answer to management abusing workers is to just get more organized and get a scheduler. No, I think the answer is to get into a nonprofit union so they don't keep offloading work on you. You will force them to hire more people and not expect you to do 5 people's jobs. That's the solution. Your thoughts? Mazarine: I agree with you (and Geri above) that this is an organizational issue and there is a lot more involved than more effective scheduling of one's time. While I didn't mean to make light of the situation, I was trying to empathize with those in "super jobs" - offering a few tips for keeping one's sanity and feel more in control of one's priorities. I found your post through the nonprofit blog carnival. Thanks for the advice and for the attention to small organizations. I, for one, like having a "superjob" because it's interesting and challenging, but it can be a difficult balancing act sometimes. Hannah: Glad you enjoyed the post. You're right the variety of roles you play in nfp jobs can keep it fresh and interesting, as long as you can maintain balance.